We will not sell any bunnies until they are at least 8-10 weeks old. We check our bunnies before they go to their new owners for any genetic issues and DQ's. We do not breed any of our bunnies with genetic DQ's. We will place them in pet only homes. If a bunny leaves our rabbitry and develops an unforseen genetic problem that has not been detected in the sire or dam or any previous litters, we cannot be held responsible. We do our best and are extremely cautious not to breed using any rabbits with known genetic DQ's. Pet owners will be provided with information on responsible bunny care and litterbox training. 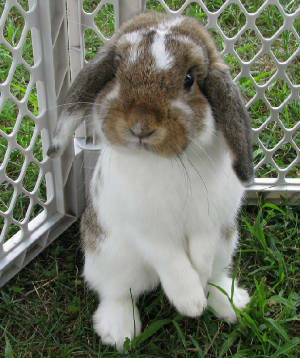 Although all our bunnies are purebred Hollands, we will not offer a pedigree for any bunny sold as a pet. If at any point you determine you can no longer take care of your bunny and need to place your bunny with someone else, please do not release him into the wild or drop him at a shelter. Try to find a suitable new owner for him. We do not take bunnies back unless we review the circumstances and have cage space available to take a bunny in. We do not offer full refunds, but at our discretion, depending on the circumstances we may choose to do so. If we have space available there will be a $10 fee to take the bunny in and find him a new home. You may contact us and we can list him on our site to help you to place him. Keep in mind as you consider purchasing a bunny as a pet that they do require care and attention and they can live for 7-12 years. You must be committed to caring for you new bunny, keeping his living space clean and giving him or her lots of love and attention. **At the time of pick up you may be asked to sign a copy of this policy to confirm that you have read it and agree to the terms.